An artist's depiction of the Voyager 2 probe traveling through our solar system. In December 2018, NASA's Voyager 2 spacecraft reached interstellar space, following the example of its sister, Voyager 1. Right now, only five spacecraft have been launched capable of making such a grand exit, including the Voyagers. The remaining three are Pioneers 10 and 11, and New Horizons. Which one will be the next to make a great escape? This milestone — reaching interstellar space — can be considered leaving the solar system by a certain definition. Let's be clear about what that entails. In 1990, the New York Times reported that Pioneer was reported to leave the solar system when it flew past Neptune's orbit. That's not what Voyager 2's scientists used to make their determination, however. Instead, the more recent measurements consider the crossing of the sun's heliopause, the theoretical boundary to its heliosphere, to be the determining factor for entering interstellar space. The heliosphere is a bubble of charged particles created by and flowing past the sun. Scientists use it to mark where interstellar space begins. The Voyager probes' observations indicate they have pierced this bubble. However, since researchers think the sun is also surrounded by the Oort Cloud, a region of icy bodies that is estimated to stretch from 1,000 to 100,000 astronomical units — far beyond the heliopause — the Voyager probes cannot be considered completely outside the solar system. (One astronomical unit, or AU, is the distance between the Earth and the sun — 93 million miles, or 150 million kilometers). The heliosphere of the solar system protects our planets from cosmic radiation. Its ever-changing shape makes it difficult to predict when a spacecraft will cross the boundary into interstellar space. When Voyager 1 and 2 crossed the heliopause, their still-functioning particle instruments revealed the historic events. The heliosphere works as a shield, keeping out many of the higher-energy particles created by the cosmic rays produced by other stars. By tracking both the low-energy particles found inside the solar system and the high-energy particles from outside of it, the instruments could reveal a sudden surge of cosmic rays alerting scientists that the spacecraft had left the solar system. So which spacecraft will be the next to cross into interstellar space? Created by the solar wind, the heliosphere is a large bubble that protects the solar system from the dangerous galactic radiation outside. The changing nature of the heliosphere makes it impossible to tell when Pioneer 10 and 11 will enter interstellar space. In fact, it's possible that one of them may have already. According to NASA's e-book "Beyond Earth: A Chronicle of Deep Space Exploration," as of Nov. 5, 2017, Pioneer 10 was about 118.824 AUs from Earth, farther than any craft besides Voyager 1. However, while Pioneer 11 and the Voyager twins were all heading in the direction of the sun's apparent travel, Pioneer 10 is headed toward the trailing side. According to 2017 research, the tail of the heliosphere is about 220 AU from the sun. Since Pioneer 10 travels about 2.5 AU/year, it will take Pioneer until roughly 2057 — 40 years — to hit the changing boundary. Pioneer 11 was estimated to be about 97.6 AUs from Earth as of Nov. 5, 2017, according to the same e-book. 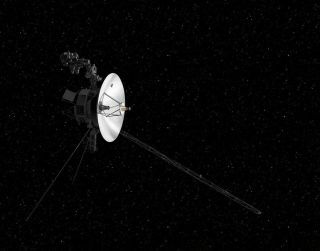 Unlike its twin, the spacecraft is traveling in about the same direction as the Voyagers. Voyager 2 crossed into interstellar medium at about 120 AUs. Since Pioneer 11 is traveling at 2.3 AU/year, it should cross into interstellar space in another decade, around 2027 — assuming the boundary doesn't change, which it probably will. Pioneer 10 and Pioneer 11 carry a plaque that features a design engraved into a gold-anodized aluminum plate attached to the spacecraft's antenna support struts to help shield it from erosion by interstellar dust. While we won't get a direct confirmation of crossing the heliopause with the Pioneer spacecraft, it's possible that New Horizons will still be functioning, and will provide a detailed study of interstellar space. The particle detectors that it is carrying are far more powerful than the ones found on Voyager, Stern said. In addition, New Horizons carries a dust detector that would provide insight into the region beyond the heliosphere. "Putting a dust detector in the interstellar medium would be a very valuable experience," he said. But it's going to be tight whether or not they will still be functioning. According to Stern, power is the limiting factor. New Horizons runs off of decaying plutonium dioxide. Right now, the spacecraft has enough power to work until the late 2030s, Stern said, and it is currently in good working order. If the ever-changing heliosphere remains static — an unlikely event — Pioneer 11 will be the next to cross the heliopause in 2027, followed by New Horizons in 2043. Pioneer 10, the first of the five spacecraft to launch, will be the last to leave the heliosphere, in 2057. Again, this assumes the extremely unrealistic possibility of the heliopause remaining static for the next 40 years. NASA's New Horizons spacecraft flies by the Kuiper Belt object Ultima Thule on Jan. 1, 2019 in this artist's illustration. It's the furthest planetary flyby in history. If you're interested in when the spacecraft will "pass" each other in the distance race, David Cranor has calculated the numbers in his blog, Nothing More Powerful. Cranor, who works in the space industry, has never worked on any of the five missions. To be clear, the spacecraft are all traveling different paths, so they won't pass each other as if they were traveling along a road. Instead, which one is the farthest out and closest to Earth will change over time. "I've always been really interested in Voyager and the Pioneers, and I just got curious about when they would pass each other when some article mentioned that New Horizons was going faster than the Pioneers," Cranor told Space.com. Working with limited data, he found that Voyager 1 passed Pioneer 11 between 1982 and 1983. He estimated that Voyager 2 overtook Pioneer 11 around March of 1988, though the changes in speed and direction suggest that it was probably sooner. Because New Horizons' passage of Pioneer 10 and 11 are both so far in the future, Cranor warned that the numbers would have a significantly high error margin. However, using the speeds each craft was traveling as of December 2017, he calculated that New Horizons would pass Pioneer 11 in 2113 and wouldn't pass by Pioneer 10 until 2187. Make sure you save the dates!